Food gives us the energy and nutrients necessary to maintain health and life, nourishing our brain, circulatorary, respiratory, digestive, and excretory systems. What better example can we get than from the life style of a colony of bees. In one colony of bees there are worker female bees,male drone bees and a single queen bee.worker bees are sterile ,their job is to take care of the hive ,collect nectar from flowers, feed the pupa with the nectar mixed with their saliva. 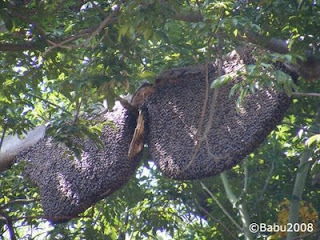 Only one pupa which is fed with what is known as ROYAL JELLY becomes aqueen bee latter. Royal jelly is fed only when the present queen bee is weak and there is need for new queen bee. Rest of the pupa blossom to become either a male drone or a worker bee. The queen bee mates in the atmosphere only once and it will lay eggs as and when required. What is this royal jelly? How only that pupa which is fed with royal jelly becomes a queen bee? No definite reason or answer is forthcoming sofar.I am really spellbound by the intelligence of these tiny creatures the way they dance to communicate, utilize sunlight as their guide in their search for nectar,keep their hive warm and clean by the scavenger bees etc. Three Types of food are consumed by the citizens. It is basically total vegetarian. Fresh fruits, vegetables,sprouting pulses,tomatoes,nuts almonds, walnut ,plantains, milk buttemilk,ghee etc.These are small in bulk, but great in providing nourishment and vitality. no doubt the vegetarian diet is rather poor in protein and minerals. But can be to a large extent compenstated with the addition of more green vegetables,nuts,fruits, with less of carbohydrate. Satvic foods produce cheerfulness, mental clarity and help to maintain mental equilibrium. It supplies the maximum energy to the body and the mind, as it is very easily assimilated and absorbed. Non vegetarian diet,meat, garlic, alcohol and tobacco are Tamasic foodstuffs as they fill the mind with ego, anger,hatred, and lethargy. Stale, dry, unripe, burnt or overcooked is all Tamasic in nature. Fermented foods like cheese and leftovers also fall under this category. FOOD PURITY:Food prepared by a person with good thoughts,intentions impart subtle vibrations which makes the food more palatable and nourishing whereas the vibrations produced by evil thoughts harm the consumer. That is the reason that same food prepared by two different persons by the same tecnique tastes different. EATING HABITS: Gone are those days when the entire family used to sit together for all three meals in the day at fixed time, how they used to talk about the delicacy of each preparation the idly, dosai, vadai, payasam etc , the entire conversation is centered around the menu only and appreciation and congratulation of the chef. 1]Eat only when you are hungry. If one disciplines to take food at fixed timing hunger pangs will come at same fixed time. 5]Family members sit together, relaxed, engaging with healthy conversation. 7]Drimk 2to 3 litters of water in 24 hrs. 4]Eating while watching T.V. or working with a computer. 9] Failure to say a word appreciation for the chef and the quality of food. 10]Do not eat when you are angry, depressed or bored. Nowadays youngsters lured by the fat salary offered by the I.T. sector they fail to understand WHAT TO EAT, WHERE TO EAT, WHEN TO EAT, HOW TO EAT AND HOW MUCH TO EAT.I will never accept when they say that no time to eat because of their commitment to job. As a result they eat sitting in front of the system, munching on whatever they can lay their hand on. Within a year or so they develop all sorts of digestive problem with flatulence,indigestion,belching,heartburn,constipation or frothy motion. It will not be long before they become irritable ,restless, loss of weight, appetite, and spend time with anger ,hatred, jealousy, and sleepless night. Bad eating habits will lead to ulcers,malnutrition,diabetis,cancer, obesity, hypertension, depression etc. As the Food So the Mind, As The Mind So the Thought, As The Thought So the Actions"